Christians are called to love irrespective of who might be the object of that love. This is bound up in the command given in the Jewish law to love our neighbour. If there is a doubt who our neighbour is Jesus made it clear when he told the Parable of the Good Samaritan it could be someone who is as far away from us as we can imagine and if there is still any doubt, he tells us to love our enemies. And of course it does not mean we have to condone their behaviour. When it comes to individuals, we will view them each in a certain way depending on the type of person we perceive them to be and upon weighing their good and bad points. When it comes to Donald Trump, most people I come across see the bad outweighing the good. My disagreeing has lost me friends, including among fellow Christians who Jesus tells us to especially love and be at one with. While on reflection I have sometimes spoken when silence may have been better, I did so because I wanted to put the record straight. I recently come across two articles recently on Facebook by two well known Christian commentators. One is John Pavlovich, who is no Trump lover and the other (I think) is Rick Warren (but I can no longer find it as the Christian friend who shared it has since “defriended” me, possibly because I commented to the effect that I strongly disagreed with what that author said). Both were making the point they can’t understand why some Christians of the Evangelical ilk support Trump and, when they do understand, it comes down to the idea that those who do are irrational, prejudiced, hypocritical or unChristian. Similar thoughts have been expressed in recent exchanges with Christian friends and too often we remain with our opposite opinions of the man, despite our best efforts to convince the other that our views are the right ones. I have written several articles about Trump, many giving my considered view of the man and his policies (see here for a list). When someone points out a perceived shortcoming, I often find myself agreeing. Not only is he like the rest of us – he has his manifold faults and foibles, which in his case is all the more glaring because of the sort of person he is, and that he has managed to upset many from among the rich and powerful (politicians from all parties, the Deep State, George Sorros, the liberal elite, academia, Hollywood, mainstream media and Christians who adopt a more left, liberal stance) who, even if we are not willing to admit it, influence our thinking more than we care to admit. As for upsetting the afore-mentioned group, I can’t help feeling that by managing to do so it at least proves Trump can’t be so bad. As I often am at pains to point out, my supporting Trump over the alternatives is not really about Trump but rather the world view he represents and my conviction that I need to stand with those who promote a view that is better for human kind than the world views the others represent, as has been eloquently explained by another well know Christian commentator, John MacArthur. I should add that when it comes to government, notwithstanding heart felt social justice and being on the side of the poor concerns, matters like law and order, security and sovereignty, life and liberty are those I see as most important. I have tried to put the case that he has done more good than bad and probably more so than any of the alternatives were they to have become President instead of Trump. 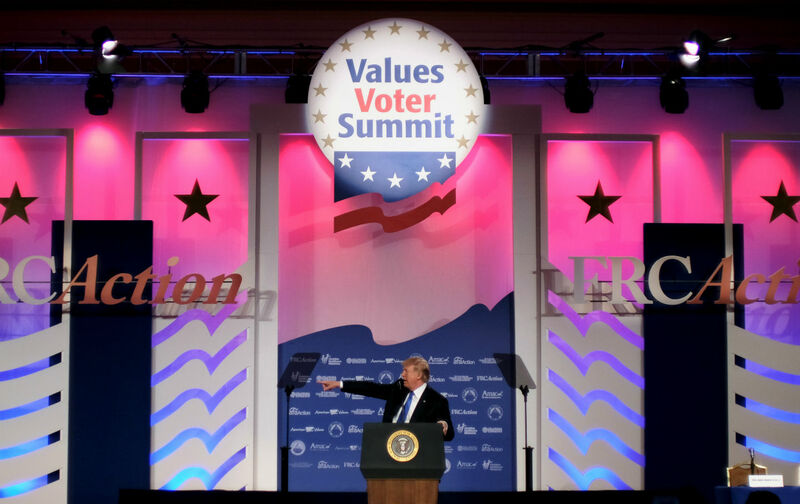 In one of the articles critical of Trump’s Christian supporters, the author poured scorn on those who had attended a recent values voter summit emphasizing the need to uphold Christian values, where Trump was cheered on by delegates. When it comes to pro-life, traditional marriage and religious freedom, I have little doubt Trump is better than Obama was and Hillary would have been, by a proverbial mile. While I agree a debate needs to be had, I am not sure I would particularly fault Trump on more contentious issues: gun control, immigration bans, health care, tax reform or not going along with disadvantageous trade deals. As for penalizing the poor and marginalized, again I am not convinced on balance he is worse than his predecessors since creating jobs has to be better than creating dependency on welfare etc., and I for one object to race etc. being made an issue when it shouldn’t be or for bringing up the nonsense of white privilege. As for these “deplorables” not caring for the less well off, I can’t speak for other pro-Trump Christians but this Christian does more for the poor etc. than most people I know. As for race etc. I agree with the late Martin Luther King (and Trump) – we should judge a person by the content of his character and not by the colour of his skin. As far as I am concerned the thing that matters is a person’s humanity. The point I have tried to unsuccessfully to put across is regarding Trump, like all other Presidents and all other alternatives is a mixed bag. We need now to accept him being president is how it is and we need to get behind him, including by prayer, recognizing he will make good and bad decisions and say good and bad things. Sadly, there are many who refuse to do this and among other burdens he faces there are threats to bring POTUS down. I happen to think, when compared with his predecessors post Reagan, he has done more good than bad than they. Even if that is a questionable statement, I believe he may be a necessary corrective to the way the world is going, on its path to destruction, and has woken people up (including me) that we don’t have to submit to globalist tyranny and we can resist the evil intents of powerful men who want to dumb down the population and subjugate it. I am less interested in making America great than making all humankind great, but any notion of an ungodly new world order fills me with foreboding. Trump if nothing else is a figure head to a movement that relates to Brexit and populist, anti-globalist risings we are seeing the world over. While I am wary of nationalism, reinforcing national identity and the values the USA was founded on (despite its faults subsequently implementing these) is a good thing for America and the world, and Trump is the right man to lead the way. He has led the way, not just in the America but throughout the world to challenge the ungodly forces of globalism. In a strange way, the divisions that have been highlighted since Trump came to power could even be a good thing, and for us Christians it might make us more reliant on God and focus on things that truly matter. For one thing to be sure, Trump like all the 44 Presidents before him, can’t save America, for only God can. The only battle that truly matters is that between good and evil, and ultimately good will win. Where I disagree with my anti-Trump friends, I believe Trump is good for the good guys, and he is more likely to drain the swamp than the alternatives. But whatever one’s views on Trump are, this should not be a falling out matter, particularly among Christians. There are more important things to attend to as the aforementioned Trump detractors have rightly pointed out. As important as these things are, it is more important to do good and acknowledge the good we find in others. Update 07/12/2017: As an added thought, I have just come across an article titled: “Rev. Graham: No President in My Lifetime Has Defended the Christian Faith Like Trump“, which got me thinking why a good many Christians, especially those who are more conservative leaning, love Trump. My own mantra as a gospel preaching community activist is to engage with the culture, ideally without being penalised e.g. as a result of the political correctness around us. I concur with the writer that Trump has made this even more possible and for the good, conscience led guys to contribute to society, including being able to serve the poor and disadvantaged, due in part to freedom of religion. Yet I have a grudging respect for those Christians who do not love Trump because of his many faults. After all we Christians lose credibility when we are beholden to personalities, especially when it is in our interests to do so and not to following our true Master who brought good news to the poor. I can’t judge other people’s motives, including the purity of Trump’s motives. But on balance I like what he does and besides loving him as I would any other, I love him because while he has made many mistakes he has done many good things, including standing for Christian freedom and welcoming their contribution. When John Piper wrote “How to Live Under an Unqualified President” on the day of Trump’s inauguration, none of us could have foreseen what will transpire in the year that followed. Many of the reservations Piper expressed then I still share although I firmly believe still he has been more a force for good rather than bad and, moreover, while I am not like Elijah who knew which king to anoint, I think in a strange mysterious way Trump has been anointed by God for such a time as this. I will pray for him and hope he will be surrounded by wise counselors for these perilous times. I end with the concluding statement by John Newton (1762) in his article titled: “More than a Calvinist“: “From hence we may observe, that believers who have most knowledge, are not therefore necessarily the most spiritual. Some may and do walk more honorably and more comfortably with two talents, than others with five. He who experimentally knows his own weakness, and depends simply upon the Lord, will surely thrive, though his acquired attainments and abilities may be but small; and he who has the greatest gifts, the clearest judgment, and the most extensive knowledge, if he indulges high thoughts of his advantages, is in imminent danger of mistaking, and falling at every step; for the Lord will suffer none whom he loves to boast in themselves. He will guide the meek with his eyes, and fill the hungry with good things; but the rich he sendeth empty away. It is an invariable maxim in his kingdom, that whosoever exalteth himself, shall be abased; but he that humbleth himself, shall be exalted”. It seems to me that Christians throughout the ages have differed on something or other, and today one area of difference is how one is to view Donald J Trump. Before falling out on this and related matters, as sadly often happens, it is worth taking note of Newton’s comments. We should recognise the good in others, and recall our Lord’s words to those who follow Him: that they be one as he and his Father is, and the world will know we are his disciples if we love one another. Update 24/08/2018: Even today, many Christians who I respect because they are sincere are attacking Trump for one reason or another. He is far from perfect but every day I see evidence of why I love the guy (today it is his speaking into South African attacks on some of its white and some black citizens that are holding back what could be a lot worse). I sense in the time leading up to November’s mid term elections those attacks will intensify. I wrote this nearly a year ago but the sentiments expressed still apply. .